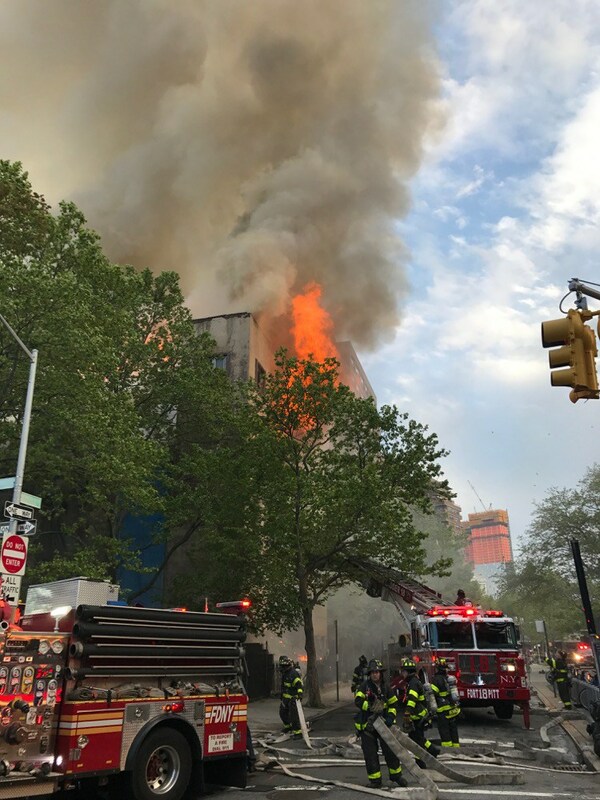 The sad news is that as of this morning, Monday May 15, 2017, a fire that started at around 7 pm Sunday May 14, has devastated the synagogue. 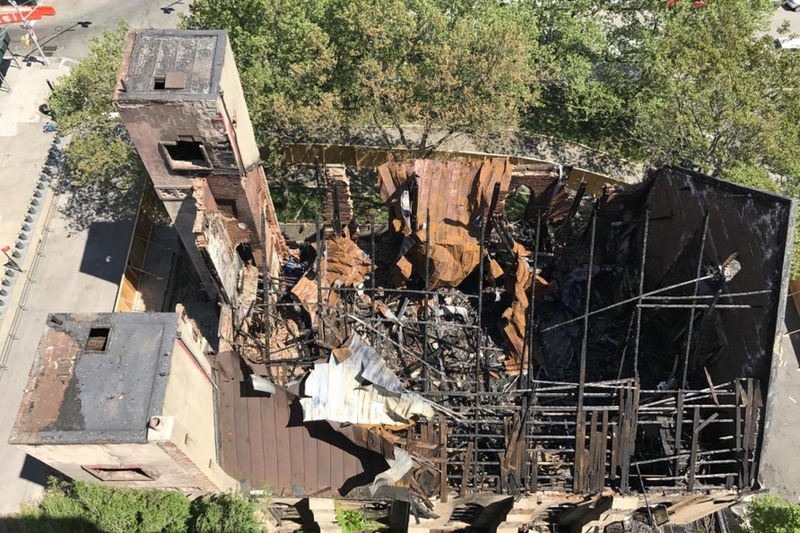 Update: At a July 11 hearing, the Landmarks Preservation Commission approved partial demolition with supervision by their engineering firm. As of December 1, 2017, careful demolition under the supervision of the Landmarks Preservation Commission has begin. As of January 1, 2018, this is all that remains. Careful demolition continues. Construction on the site is planned. The developers are urged to incorporate what they can of the remaining structure in the new building. The site is still a NYC Landmark. See our news page for the latest links. Beth Hamedrash Hagodol Synagogue (Great House of Study), 60 Norfolk Street. Originally Norfolk Street Baptist Church, constructed in 1850. This mid-nineteenth-century Gothic Revival structure was erected by a Baptist congregation that evolved into Riverside Church on the Upper West Side. Beginning in 1860, it was occupied by a Methodist church for twenty-five years. In 1885 the building was acquired by Beth Hamedrash Hagodol and remodeled as a synagogue for the nation’s oldest Orthodox Jewish Russian congregation, founded in 1852. The synagogue was recognized as a center for prayer, religious study and the interpretation of Jewish law, and had a tradition of learned rabbis. Its founder Rabbi Abraham Joseph led the way in training Jewish scholars in America. In 1899 the eminent Rabbi Jacob Joseph became its spiritual leader. The much-revered Rabbi Ephraim Oshry, religious leader of the Kovno ghetto in Lithuania and a Holocaust survivor held that position from 1952 until his death in 2003. Striking in profile, this smooth-faced stone Synagogue is an interesting example of modified Gothic Revival architecture. Raised on a platform of steps above the street, the recessed center section of the symmetrical façade is flanked by square towers pierced by coupled pointed arched windows that light the side vestibules. The dominant feature of this structure is the main, double entrance door with over-door panel joining it to the tall tripartite arched window, surmounted by a pedimented roof, affixed with the Star of David. A handsome horizontal band of Gothic quatrefoil design meets the spring of the arch of the large central Gothic window and enriches the rather plain façade. At the top of each tower is a square decorative panel of Gothic quatrefoil design. 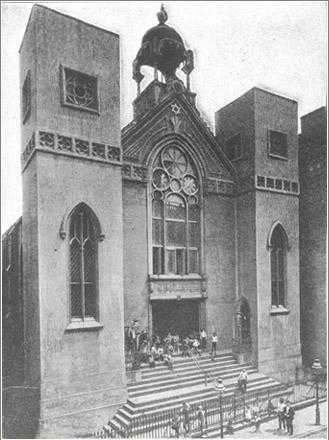 This great Synagogue has long been considered a landmark by the Greater New York Board of Rabbis, by the Union of Orthodox Congregations of the United States representing three thousand congregations and by citizens of the community. The Synagogue is noted especially for the services it has rendered to the many orthodox Jews from eastern European countries who migrated to the United States during the late Nineteenth and early Twentieth Centuries. Congregation Beth Hamedrash Hagodol is the oldest Russian Orthodox Synagogue in the country. Founded in 1852, its first building was on Allen Street. The present Synagogue was acquired June 17, 1885 from the Methodist Church and remodeled that year. 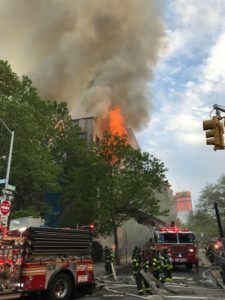 The building was formerly the Norfolk Street Baptist Church, whose congregation evolved into Riverside Church on the Upper West Side. The congregation has an enrollment of 1400 members and serves more than 250,000 worshippers annually from the entire country. The earliest rabbi was the Russian-trained Abraham Joseph Ash, a successful manufacturer who served without pay until 1873. 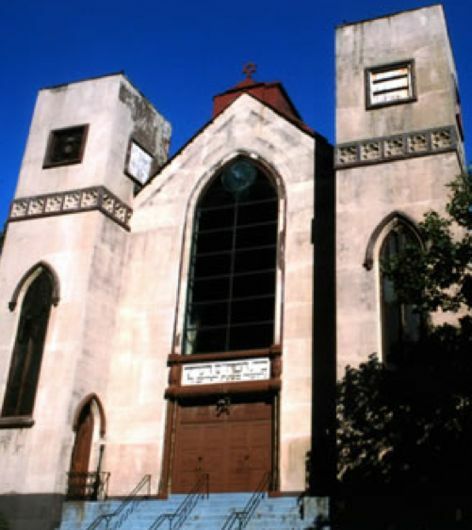 The building, now occupied by Beth Hamedrash Hagodol Synagogue, was dedicated in January 1850 as the Norfolk Street Baptist Church. As the neighborhood changed and the city moved uptown so did the Baptists. In 1860 the Methodists purchased the church and kept possession of the property until 1885. An early print published in the New York Almanac of 1851 shows that the towers of the church originally had battlements or crenelations, which were removed from the building when it was remodeled. 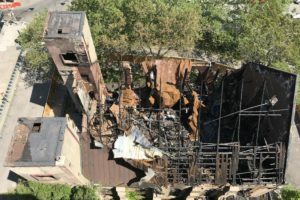 Efforts to restore the historic synagogue, led by the Lower East Side Jewish Conservancy, have raised close to $500,000 for a feasibility study and urgent repairs. It has embarked on a major initiative for additional funds for interior structural stabilization, new mechanical systems and facilities, restoration of design elements, and adaptation of the vast structure for various uses. All of these funds were matching grants and, since the present synagogue leadership did not engage in fundraisng, that effort went nowhere. The current rabbi has submitted an application seeking a hardship declaration and demolition permit for the building. Destruction of this historic structure would be a tragic loss for the Jewish heritage of the Lower East Side. The rabbi has now suspended the application while he and supporters seek a solution that will preserve the structure.